Every March 17th, Bellingham lays out the green carpet for a St. Paddy’s Day celebration. This year, the Irish-inspired holiday falls on a Saturday! And with so many things to do, bars to drink at, and corned beef to eat, we’ve compiled a list to help narrow down and plan your own celebration...hopefully all ending with a peaceful night at the Heliotrope Hotel. Once used to explain the Holy Trinity to the pagan Irish, the three-leaved shamrock represents Catholics in Ireland. Saint Patrick, the foremost patron saint of Ireland, died on March 17th. Lenten restrictions on eating and drinking alcohol are lifted for St Paddy’s Day (which may have encouraged the tradition of ...heavy… alcohol consumption). Get a little exercise, give back to the community, and/or enjoy the local parade. 10am: Runnin O’ the Green. A 5k run/walk starting and ending at Boundary Bay Bistro. Entry fee is $35. 10am - 3pm: St. Paddy’s Green Thumb Work Party for Northwest Youth Services. Think compost, mulch, and building beds and planters. If you haven’t volunteered with NWYS before, contact Terrah at terrahs@nwys.org. 12 - 2pm The Bellingham St. Patrick’s Day Parade. The Parade starts at the corner of Ohio and Cornwall and ends at the other end of Cornwall by Boundary Bay Bistro. There’s no end to the Bellingham bar scene with what seems like a new spot opening every week. Below are some that are taking the time to take it up a notch for St. Paddy’s. The Shamrock Pub is decked out in shamrocks and leprechauns 365 days a year. Drink Guinness or Harp and best of luck with those pull tabs. Not feeling traditional Irish food? The taco truck is usually nearby. A beer garden, live music, and the linchpin for some daytime activities. The party starts at 11am. Irish music all day from a number of different Irish outfits. Doors open at 11am. Green lighting, party props, Irish-themed music, and some solid beer. Craving corned beef and cabbage? You can order from The Blue Abode Bar for pickup or delivery. Head down at 12pm. You guessed it – Irish inspired food and beer. Live Irish music starts at 6:30pm. Want to avoid the crazy bar scene? Or just need a break to fill up your belly with some sustenance? Check out these restaurants serving some Irish classics (and still snag a beverage). Pop in for Irish pot roast and cabbage, a $3 Beer, and why not…. a $3 Whiskey shot (remember, beer before liquor….)! Their menu starts at 2pm and goes till close. If you want to avoid the hot mess that will be downtown, head north towards the airport for traditional corned beef, reubens, Guinness Stew, and a tall glass of Guinness to wash it all down. The best way to top off St Paddy’s is with a little Irish jig (get jig-gy with it). Tucked away in the alleyway up from Boundary is The Honeymoon where Meghan Yates and The Reverie Machine will play from 8:30-11:00pm. Their sound is romantic, powerful, and uplifting. Free entry. 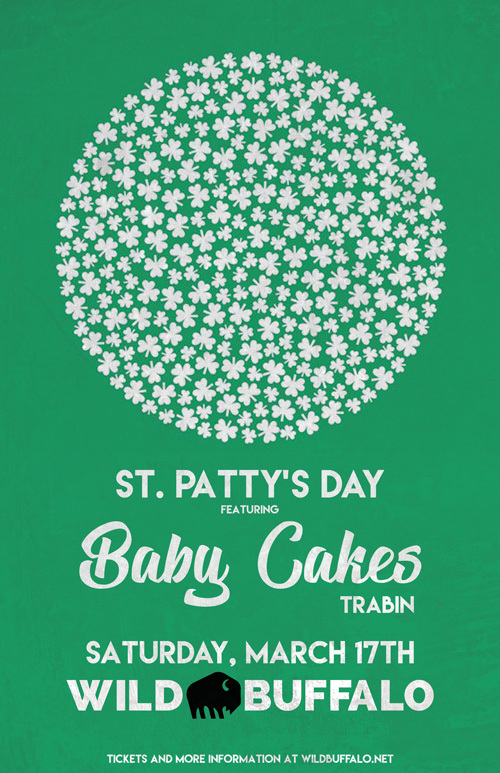 Local favorite Baby Cakes is playing at The Wild Buffalo from 9pm-12:30am. Prepare to get down to classic funk, soul, and R&B plus some original tracks. Doors open at 8 so grab a drink and map out your territory on the dance floor. $7 in advance. Don your shamrock pins and green Patagonia (or Tevas, if the weather holds out)! Stay safe, stay hydrated, and have a Happy St. Paddy’s Day! Maybe you’ll find a bit ‘o the green in your room – you’ll just have to stay at the Heliotrope to find out!